Expanded polystyrene foam (EPF) is a plastic material that has special properties due to its structure. Composed of individual cells of low density polystyrene, EPF is extraordinarily light and can support many times its own weight in water. Because its cells are not interconnected, heat cannot travel through EPF easily, so it is a great insulator. EPF is used in flotation devices, insulation, egg cartons, flats for meat and produce, sandwich and hamburger boxes, coffee cups, plates, peanut packaging, and picnic coolers. Although it is generally called Styrofoam, Styrofoam is a trademark of Dow Chemical Company and refers specifically to a type of hard, blue EPF used mainly in boating. During the late 1800s, researchers seeking materials suitable for making film, carriage windshields, and various small items such as combs produced early plastics out of natural substances and chemicals. In making these plastics, the scientists exploited the natural tendency towards polymerization, in which two or more small molecules, or monomers, combine to form chains that are often very long. The resulting molecular chains, or polymers, comprise repeating structural units from the original molecules. One of the most familiar natural polymers is cellulose, the string of glucose molecules that forms a primary component of plant cell walls, cotton, paper, and rayon. Polystyrene is among the best-known synthetic polymers (others include polyethylene, polypropylene, and polyester). Styrene, the liquid hydrocarbon from which EPF is made, was derived in the late nineteenth century from storax balsam, which comes from a tree in Asia Minor called the Oriental sweet gum. In the early nineteenth century, completely synthetic plastics were developed from hydrocarbons, whose structure is conducive to easy polymerization. Polystyrene, the polymer from which EPF is made, was invented in 1938. Foaming plastics were discovered indirectly, because in the beginning no one could see their advantages. Dr. Leo H. Baekeland, the American chemist who developed the first completely synthetic plastic, bakelite, experimented with phenol (an acidic compound) and formaldehyde (a colorless gas) while trying to make a nonporous resin. When one of his mixtures unexpectedly began to foam, Baekeland tried to control the foam before realizing that it could have advantages. Following Baekeland’s death in 1944, the first foamed phenolics were developed, soon followed by epoxy foam. A short time later, polystyrene was foamed. At first it was used mainly in insulation and flotation devices for boats, life preservers, and buoys. It was not until EPF replaced paper, kapok (made from the silky fibers that encase ceiba tree seeds), and other natural packaging protection that the substance became as popular as it is today. Its familiarity was furthered by the enormous growth of the fast food and takeout industries, which began to use EPF in burger boxes and coffee cups. Today EPF is easily the most recognized plastic. However, despite EPF’s popularity and unique features, it has recently come under attack because of the gaseous methane derivatives—chlorofluorocarbons (CFCs)—used to foam it. CFCs are inert, and harmless to humans and the environment upon their release. However, long after their first use, scientists realized that CFCs contribute to the depletion of the ozone layer as they decompose. The ozone layer is a layer of the atmosphere that protects the earth against harmful ultraviolet rays from the sun. In 1988 representatives from 31 nations signed the Montreal Protocol, a treaty with which they resolved to halve CFC production by 1998. This agreement brought EPF to the world’s consciousness as a threat to the ozone layer. While foam packaging is responsible for less than three percent of the CFCs being released into the atmosphere, EPF reduction has been targeted as a way to lower CFC levels, and new technology that explores ways to produce EPF without CFCs has flourished. EPF has also been singled out by environmentalists because it is not being recycled. Action has been taken, however, and programs are under way to see that a greater percentage of EPF will be recycled in upcoming years. EPF’s main component is styrene (CsHs), which is derived from petroleum or natural gas and formed by a reaction between ethylene (C2H4) and benzene (CsHs); benzene is produced from coal or synthesized from petroleum. Styrene is polymerized either by heat or by an initiator such as benzoyl peroxide. Stopping the polymerization is difficult; however, inhibitors such as oxygen, sulfur, or quinol can be used. To form the low-density, loosely attached cells EPF is noted for, polystyrene must first be suspended in water to form droplets. A suspension agent, such as specially precipitated barium sulfate or copolymers of acrylic and methacrylic acid and their esters (organic product formed by the reaction between of an acid and an alcohol), is then added to the water. Numerous suspension agents are used commercially. All are similarly viscous and serve to hold up the droplets, preventing them from sticking together. The beads of polystyrene produced by suspension polymerization are tiny and hard. To make them expand, special blowing agents are used, including propane, pentane, methylene chloride, and the chlorofluorocarbons. Like all plastics, EPF consists of a polymer chain with great molecular weight. A molecule’s weight is equivalent to its mass and can be calculated by adding the mass of its constituent atoms. EPF is a linear polymer whose basic unit is styrene (CsHs) and whose molecular mass is 104, yet when it is linked together as it is in the plastic, its mass can range between 200,000 and 300,000 (because a polymer chain can contain an indefinite number of molecular links, a terminal mass cannot be determined). First, styrene is made by combining ethylene and benzene. Next, the styrene is subjected to suspension polymerization and treated with a polymerization initiator, which together convert it into polystyrene. Once a polymer chain of the desired length has formed, technicians stop the reaction with terminating agents. The resulting polystyrene beads are then cleaned, and anomalous beads filtered out. To make small-cell EPF, workers then melt, add a blowing agent to, and extrude the beads. To produce smooth-skinned EPF, they pre-expand the beads, dramatically reducing their density. Next they heat and expand them before allowing them to sit for 24 hours so that they can cool and harden. The beads are then fed into a mold of the desired shape. 1 The basic unit of polystyrene is styrene, which is the product of a two-fold reaction. Ethylene and benzene, in the presence of a catalyst such as aluminum chloride, form ethylbenzene (CsHs), which is then dehydrogenated (hydrogen is removed) at 1,112-1,202 degrees Fahrenheit (600-650 degrees Celsius) to form styrene (CsHs). 2 Polystyrene is formed from styrene through suspension polymerization, a process by which tiny drops of the monomer (in this case, styrene) are completely surrounded by water and a mucilaginous substance. Supporting and surrounding the styrene globules, the suspension agent produces uniform droplets of polystyrene. 3 Next, a polymerization initiator is added to the droplets, which are suspended by heat radiation of about 212 degrees Fahrenheit (100 degrees Celsius). This results in free radicals, a group of atoms particularly likely to react with others because they contain unpaired electrons which are available for molecular bonding. Free radicals then combine at randomly to form chains of polystyrene. 4 Stopping the polymerization process is difficult. Terminators are introduced to the process to end it at the appropriate time. Though variable, chain length must fall within a certain range, because polystyrene with overly long chains won’t melt readily, and polystyrene with short chains will be brittle. 5 After polymerization is complete, the mixture—consisting of beads made up of polystyrene chains—is cooled. These beads are then washed out and dried. Uniform bead size is achieved by sorting the beads through meshes which filter out over- and undersized beads. 6 First, the beads of polystyrene must be expanded to achieve the proper density. 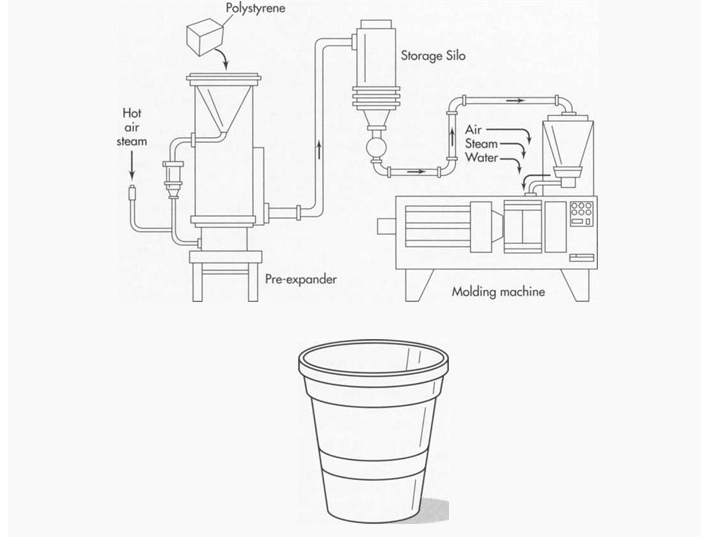 This process is known as pre-expansion, and involves heating the polystyrene either with steam (the most common method) or hot air (for high density foam, such as that used for a coffee cup); the heating is carried out in a vessel holding anywhere from 50 to 500 gallons (189 to 1,892 liters). During pre-expansion, an agitator is used to keep the beads from fusing together. Since expanded beads are lighter than unexpanded beads, they are forced to the top of the vessel’s cavity and discharged. This process lowers the density of the beads to three percent of their original value and yields a smooth-skinned, closed cell EPF that is excellent for detailed molding. 7 Next, the pre-expanded beads are usually “aged” for at least 24 hours in mesh storage silos. This allows air to diffuse into the beads, cooling them and making them harder. 8 After aging, the beads are fed into a mold of the desired shape. Low-pressure steam is then injected into and between the beads, expanding them once more and fusing them together. 9 The mold is then cooled, either by circulating water through it or by spraying water on the outside. EPF is such a good insulator that it is hard to cool the mold down. Using small molds can reduce both the heating and cooling time and thereby speed up the process. Making extruded, expanded polystyrene foam. This process yields EPF with small cell size that can be used to manufacture boards used for insulation. The beads are melted, and a blowing agent is added. The molten polystyrene is then extruded into the proper shape under conditions of high temperature and pressure. EPF is usually cut with common wood- working tools, which must be kept very sharp at all times to cut smoothly. It can also be bonded with adhesives that do not destroy it. Water-based adhesives are good, as are phenolics, epoxies, resorcinols, andureas. EPF is not resistant to weathering or sunlight, and it is flammable, so generally coatings such as epoxy, different kinds of paint, and nonflammable substances are applied to the surface. EPF is subject to the numerous tests and standards formulated by the American Society for Testing and Materials (ASTM) for plastics in general. Some of these standards concern EPF in particular because of its unique properties, yet some of the tests applied to EPF were developed to measure the properties of other plastics. The polystyrene melt is tested to determine whether it is sufficiently viscous to produce EPF with the desired properties. Further, the subsequent polystyrene beads must be of uniform size. The standard for perfectly spherical beads is based on those formed in space shutde experiments under conditions of zero- gravity. Molded EPF is also tested for strength, flammability, and density, which is particularly important when testing flotation devices. EPF’s resiliency is measured by banging a pendulum against the material and observing how far it rebounds. EPF is then tested for porosity. This involves determining how many open and closed cells there are, after considering the surface area of the product and the number of cells cut by fashioning. Permeability is then tested. A simple test involves placing a piece of EPF into a sub-stance and then measuring how much of it is absorbed. Thermal conductivity is important whenever EPF is used for insulation. Cellular plastics have the lowest thermal conductivity (transmission of heat) of any solid material known. They insulate so well that testing for thermal conductivity is time-consuming, even when thin sheets are used. The thin (.79-2 inches or 2-5 centimeters) sheet of EPF is placed next to a heater plate, and both are enclosed by cold plates to minimize heat loss. A controlled, small amount of heat is then applied to one side of the sheet, and, after several hours, the amount of heat penetrating to the other side is measured. Of course, all data must meet the standards for EPF. EPF can safely be incinerated and will yield only carbon dioxide and water if the procedure is handled correctly, but the trend has been to recycle it wherever possible. EPF can be recycled into concrete, egg cartons, office products, foam insulation, and garbage cans. Unfortunately, only one percent of the 11 billion kilograms of EPF thrown away each year is being recycled. The National Polystyrene Recycling Company, which consists of seven major corporations, including Amoco, Dow, and Mobil, plans to increase this to 25 percent by 1995 by focusing on big users of EPF—fast food outlets and college dining establishments. Since the Montreal Protocol of 1988, new research has focused on ways to reduce CFC use, and on developing alternative blowing agents that will not harm the ozone layer. Recent developments include a process that uses pressurized carbon dioxide to produce smaller, more uniform cells. These in turn provide a foam that is stronger and smoother than earlier foams. Beck, Ronald D. Plastic Product Design. Van Nostrand Reinhold Company, 1970. Concise Encyclopedia of Chemical Technol¬ogy. John Wiley & Sons, 1985. Kaufman, Morris. Giant Molecules: The Technology of Plastics, Fibers, and Rubber. Doubleday and Company, Inc., 1968. Modern Plastics Encyclopedia, 1981-1982. McGraw-Hill, 1981. Richardson, Terry A. Industrial Plastics: Theory and Application. South-Western Publishing Co., 1983. Wolf, Nancy and Ellen Feldman. Plastics: America’s Packaging Dilemma. Island Press, 1991. Bak, David J. “Microcells Toughen Foam Sheet,” Design News. January 23, 1989, p. 170. “Foam Technologies Eliminate CFCs, reduce VOCs,” Design News. November 20, 1989, p. 34. Kirkman, Angela and Charles H. Kline. “Recycling Plastics Today,” Chemtech. October, 1991, pp. 606-614. Powell, Corey S. “Plastic Goes Green,” Sci¬entific American. August 1990, p. 101.